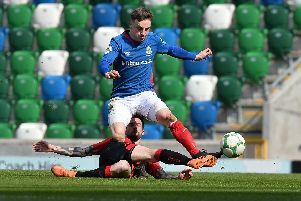 Ben Doherty's late equaliser denied his former side Glenavon the chance to leapfrog Crusaders into third place in the Danske Bank Premiership. 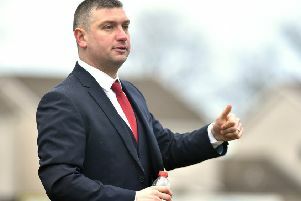 Jamie McGonigle saw his early penalty save by Johnny Tuffey and it looked as though it would prove costly as Sammy Clingan's second half penalty put the home side in front. But it looked like a harsh decision on the visitors, as Steven Douglas looked to have pulled out of the challenge on Stephen Murray. Right on 90 minutes though the former Glenavon man Doherty thumped home past Johnny Tuffey from distance to level things up. It took a fantastic save from Chris Johns though to earn his side a point to deny Clingan in stoppage time. Coleraine were presented with a great opportunity to open the scoring with eight minutes gone after McGonigle was tripped by Eoin Wearen in the box. The striker dusted himself down but saw his spot kick saved by Tuffey in the home goal. James Singleton exchanged passes with Andrew Mitchell on 15 minutes with the defender curling a shot inches over. Mitchell then tried his luck with an acrobatic effort from an Aaron Harmon centre six minutes later, but it was straight at Chris Johns. At the other end Tuffey gathered James McLaughlin's low free kick on 24 minutes. Back came the hosts with Josh Daniels forcing Johns into a good save at his near post three minutes later. On the half hour Cormac Burke had Tuffey scrambling across his goal with a turn and shot from the edge of the area. The Lurgan Blues edged in front in the 62 minutes after Keith Kennedy awarded his second penalty of the game. This one looked very soft though as Murray went down under the challenge of Steven Douglas. Coleraine protested, but Clingan stepped up to coolly slot home his second penalty in a week. The midfielder went close again on 68 minutes, this time Johns tipped over his curling free kick. And the Bannsiders keeper had to be alert to block a Murray effort on 78 minutes after the forward had got on the end of a long through ball. There was late drama though as Jamie Glackin crashed a shot off the bar, the ball was kept alive and fed to Doherty, who fired in from the angle. Three minutes into stoppage time Clingan went close to firing in another late winner for the Lurgan Blues, but Johns produced a superb save to tip over his deflected free kick. Glenavon: Tuffey, Daniels, Marshall, Mitchell (Hamilton 87), Harmon, Clingan, Murray, Singleton, Garrett, Wearen (Hall 66), Sharkey. Subs: Taylor, McCloskey, Norton, Jenkins, Stewart. Coleraine: Johns, Mullan, Douglas, McLaughlin (Bradley 67), O’Donnell, Parkhill (Glackin 67), McGonigle, Canning, B Doherty, Burke (Carson 64), Shiels. Subs: M Doherty, Crown, Edgar, Davidson.